Please visit Primary and Secondary Guided Inquiry units’ pages on this blog to see some contributions from Charles Sturt University students, studying Introduction to Teacher Librarianship. 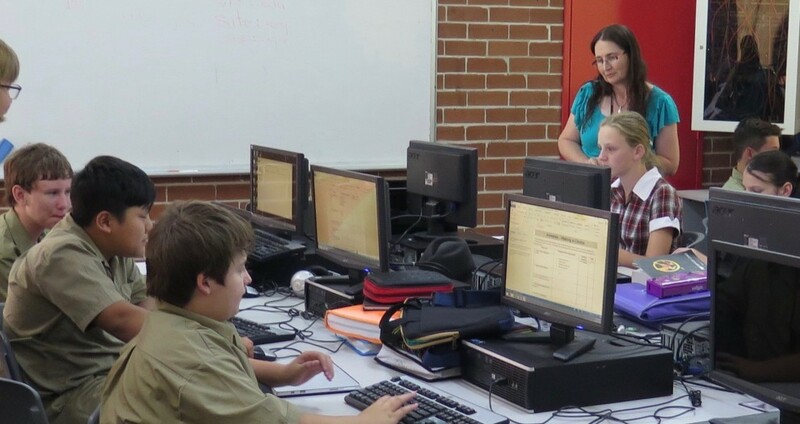 Their task was to choose an information literacy model (Guided Inquiry, I-LEARN, PLUS, NSW ISP, Big6, Information Fluency etc), and to create an inquiry unit for Technologies F-10. Go have a look! What’s been happening in the local GI world? My book, Guided Inquiry Goes Global: Evidence-based Practice in Action, is coming out in September through ABC Clio. Alinda Sheerman, Kasey Garrison and I have been doing quite a lot of research, focusing on gathering and heeding the student voice on Guided Inquiry. More on this later! 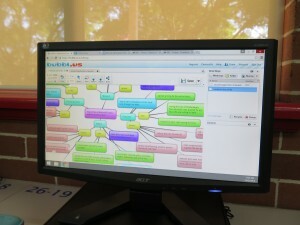 Up till now, the Guided Inquiry Community has been available at: http://guidedinquirycommunity.pbworks.com. (It will still be available there, while we design and move over to the new Edublog site). We’ve chosen the Edublog platform because we like the idea of the community becoming more of an interactive and proactive space. We hope that every one with an interest in Guided Inquiry can learn, share, and contribute questions, units of work and scaffolding, and be part of the excitement of inquiry learning. We are also very pleased to help you with the design of Guided Inquiry units. Lee and Alinda have worked together since 2008 on inquiry learning, after being inspired by Professor Ross J. Todd, whose emphasis on information literacy as a pedagogy has fostered deep learning in students. Guided Inquiry developed from the work of Professor Emerita Carol Collier Kuhlthau on the Information Search Process (ISP). Since 2012, and the publication of Guided Inquiry design: A framework for inquiry in your school (Kuhlthau, Maniotes and Caspari), the Guided Inquiry Design process has complemented the ISP, and Guided Inquiry has developed into a coherent pedagogy for inquiry learning in schools. Lee is a lecturer in teacher librarianship at Charles Sturt University, and Alinda is Head of Information Services at Broughton Anglican College, Menangle Park. Kuhlthau, C., Maniotes, L., & Caspari (2012), A. Guided Inquiry design: A framework for inquiry learning in your school. Santa Barbara, California: Libraries Unlimited. Just letting you know that I’ve been updating the GI Oz community, with some new GIs from Broughton College, and also from my students at Charles Sturt University. 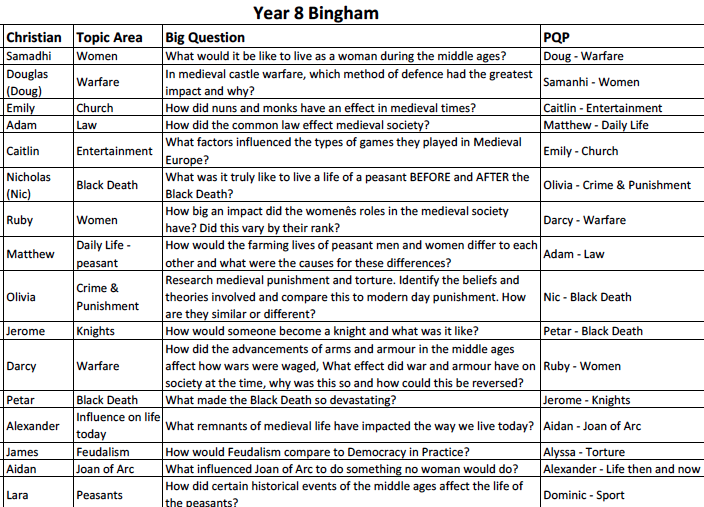 It’s just coming to that time in the term where students need to get their heads around planning an inquiry unit, and to that end, and just because it needs it, I’ve spent some time updating. A report on the research that Dr Kasey Garrison and I have been carrying out over the last four years. It’s linked to a new page in GI Theory, called Australian GI research. Kasey and I are just about to start a new research project at Broughton, which replicates what we did in our 2015/2016 research at Loreto Kirribilli, thus contributing to a body of research on Guided Inquiry in Australia, carried out under the auspices of CSU. Go have a look! It would be really good to get comments from our 100 subscribers, as well as any questions, units of work, scaffolds you might like to contribute. Last Friday we had a whole day of activities for all of Year 8 in the School Hall. Students had decorated the walls and added to this during the morning with the work they produced. First a ‘Forum of Experts’ were interviewed by one of the teachers who happened to be the Head of Humanities who has a great deal of historical knowledge. Following this the students organized themselves into groups of 10 or 11 and a teacher supervised each group with an activity that led into a brief oral assessment task. 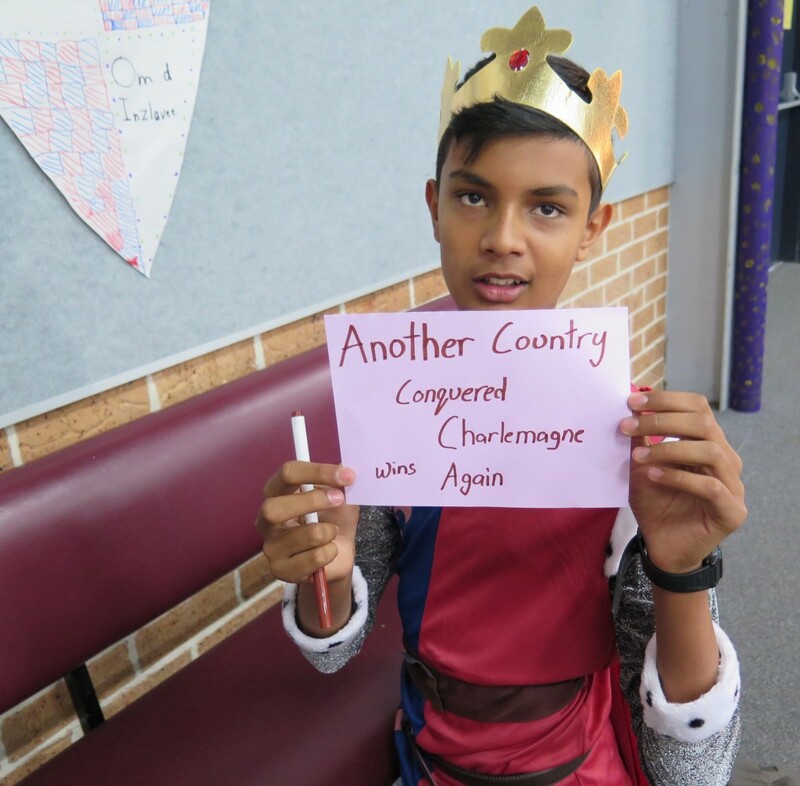 The students had to consider a headline that would point others to their specialty area and when this was finished the teachers led students to talk about their headline and how this fitted into their knowledge area and then the whole topic. After recess games were organized with due care to hygiene and safety! Apple bobbing was very popular but as each round needed to have the bowls cleaned and refilled this activity was interspersed with rounds of jousting! Lunch was inside on picnic rugs with food to share and some had cooked appropriate food. 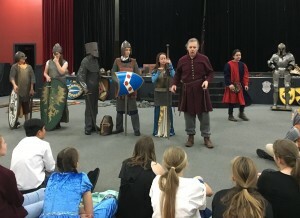 A visiting historical troupe came after lunch with medieval armour and weapons. 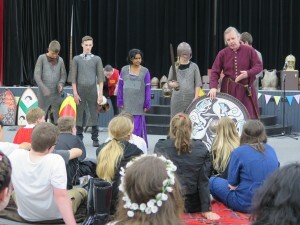 After a demonstration and talk the students – and teachers – tried on armour and held weapons. A few students found themselves in the stocks and others found out how uncomfortable and heavy chain armour really is! Completing the unit was just the beginning of the next spiral of action research. 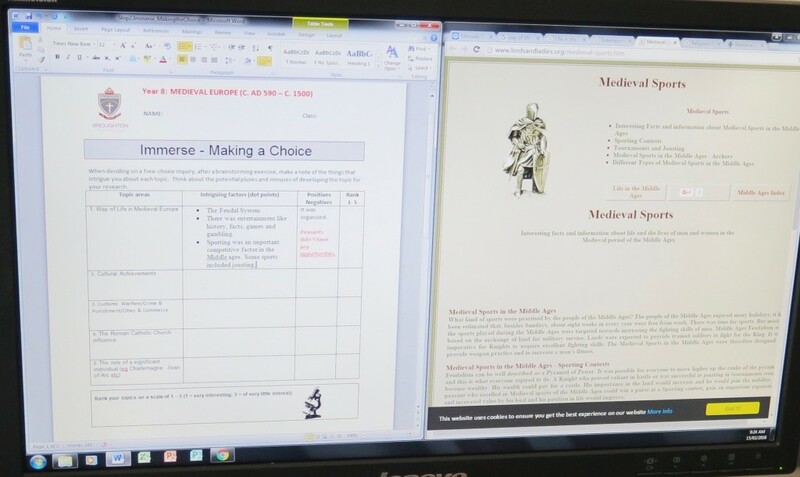 On Friday at the Medieval day (culminating activity) one of the teachers told me she had a list of things to improve on this Medieval Day for next year and the three surveys I took at different stages also play a part in evaluating and preparing for next year. This is the part of Guided Inquiry I love the most. At best it is a ‘Goose Bumps’ experience and that is what happened in one of the Year 8 classes. The amount of knowledge some students have at the end of their research is unbelievable. 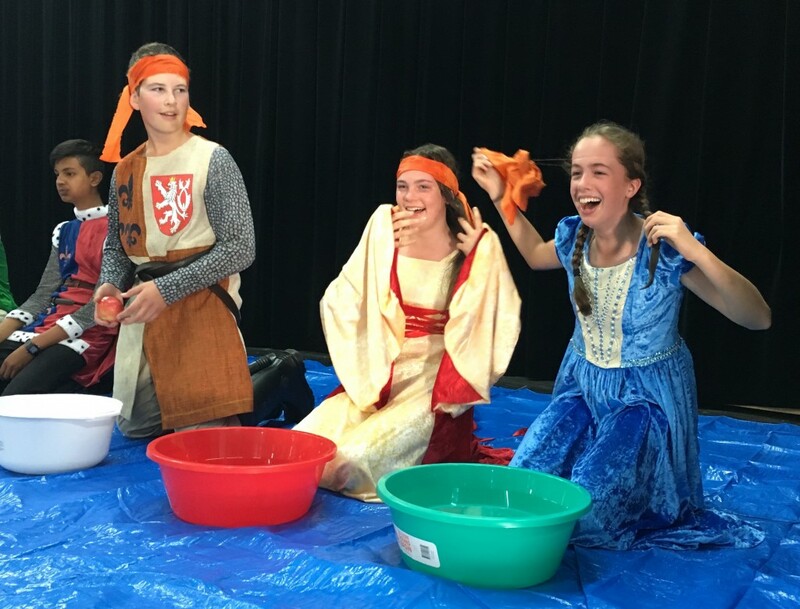 Rather than have the students prepare a “Death by PowerPoint” experience we wanted to see what they actually knew and could speak about without special preparation. Two of the four classes have now held their ‘Share’ Seminar and every student contributed in some way to the discussion. 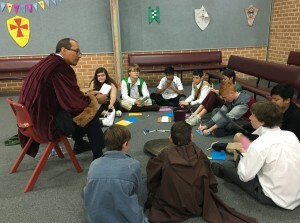 The room was arranged in a circle and the teacher presided, assisting in the flow of discussion. Some amazing experts were discovered and most of the topic areas were covered either briefly or in great depth. This was part of their assessment but, after the discussion got going, nerves were forgotten and some real personalities and passions were exhibited. I have edited what could have been a lengthy video into a few segments for sharing here. This girl was very knowledgeable about the punishments metered out to women in the Middle Ages! This young man is the ultimate expert on armour and weapons of the Middle Ages. For anyone interested, this clip shows Mr Chris Main setting up the Seminar – requirements and protocols. Surely four collaboratively planned and taught Year 8 classes doing Guided Inquiry at once is a bit too much? Well… it has been manageable but some aspects of my other roles have been wanting in fine detail and a ‘catch-up’ will have to take place soon! 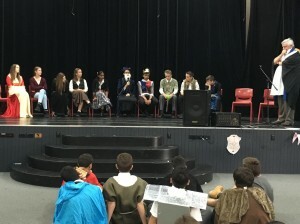 I did, however manage to also take three teams to the Sydney heat of the Australian Kids Lit Quiz last week where the students performed very well – but my Library Assistant, who actually trained the teams, told me that my “Children’s Literature” knowledge was slipping very badly and I really must read more books. She gave me a selected pile of books and one has been read already! Now – back to Guided Inquiry! 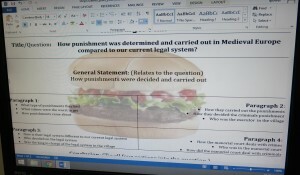 The students were given their assessment task which includes a class component and formal assessment. The students have been busily planning their reports for a lesson or two and, even at this stage, as the class teacher and I sit beside students and discuss their work, some questions are ‘tweaked’ to make the report easier to write. 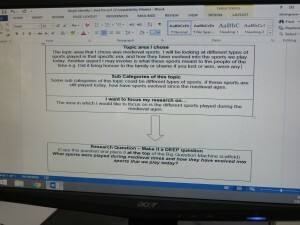 I am always intrigued by how thoroughly the students know their topic area by this stage and really ‘own’ their work. 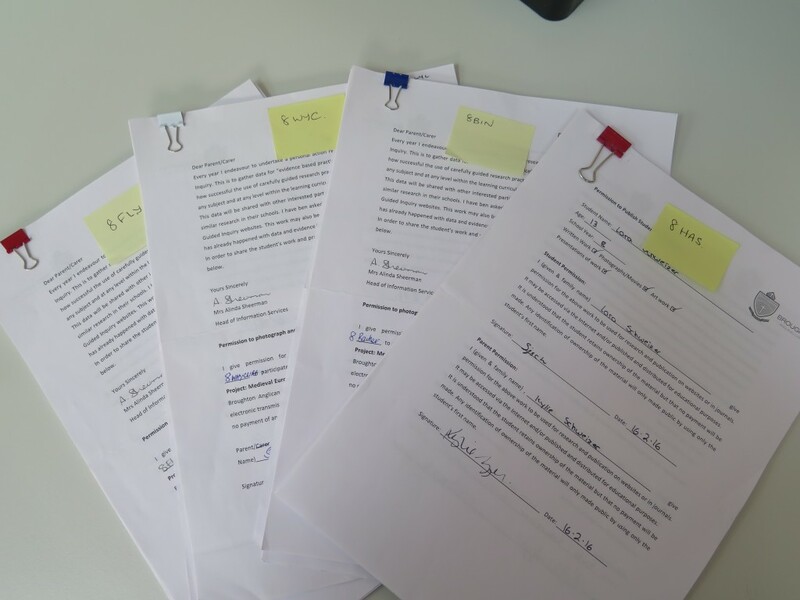 When writing up the reports from their plans it is interesting to see how many students know their topic so well that they hardly need to refer to sources. Plagiarism is at an all time low because of this. 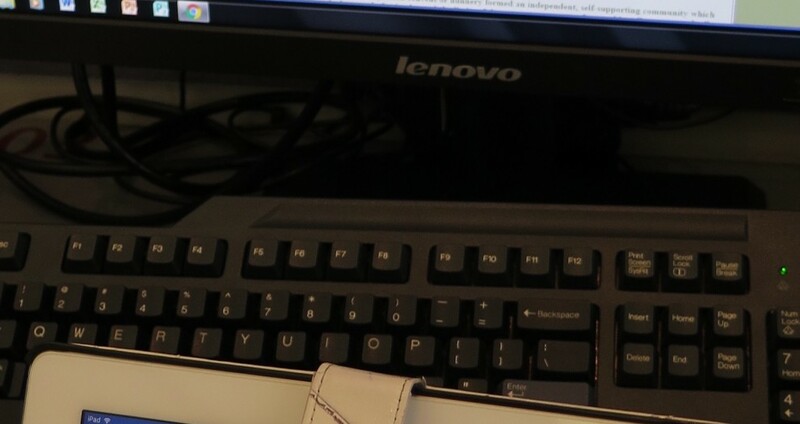 When students were booked into a computer lab and also had their BYOD with them they became very resourceful and used both! I made a ‘Small Group’ for students to post up their Big Questions into Edmodo so that I could gather them easily. 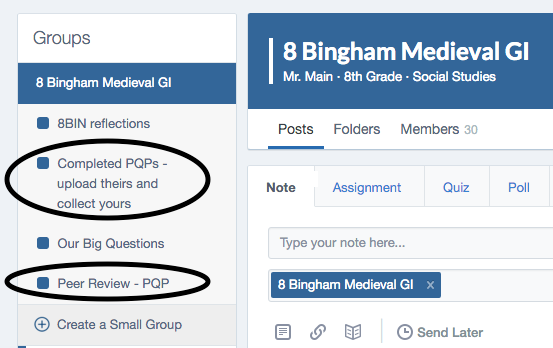 While they are busily working on reports I will be sorting them into topic areas ready to allocate each student a peer for peer evaluation of a report on a topic area quite different to their own. 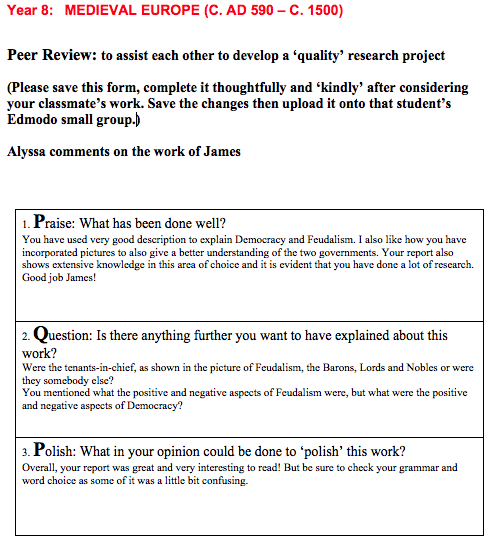 This Peer Review will take place in a combined Step 7/8: Share/Evaluate. The Due date was yesterday and there they all were – on time and complete! 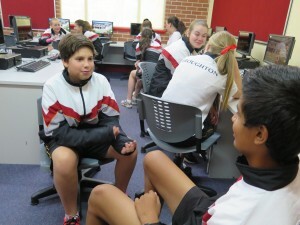 Step 7 Share: Today the first class ‘Shared’ their learning and knowledge in a class ‘circle’. It was amazing. The teacher said to me after the lesson of 50 minutes, that it could have easily gone on for another whole lesson. It was an amazing display of knowledge, intelligent questions specifically asked to individual ‘experts’ and all captured on video with permissions to use online. Step 4 Identify – the “Big Dip” or not! 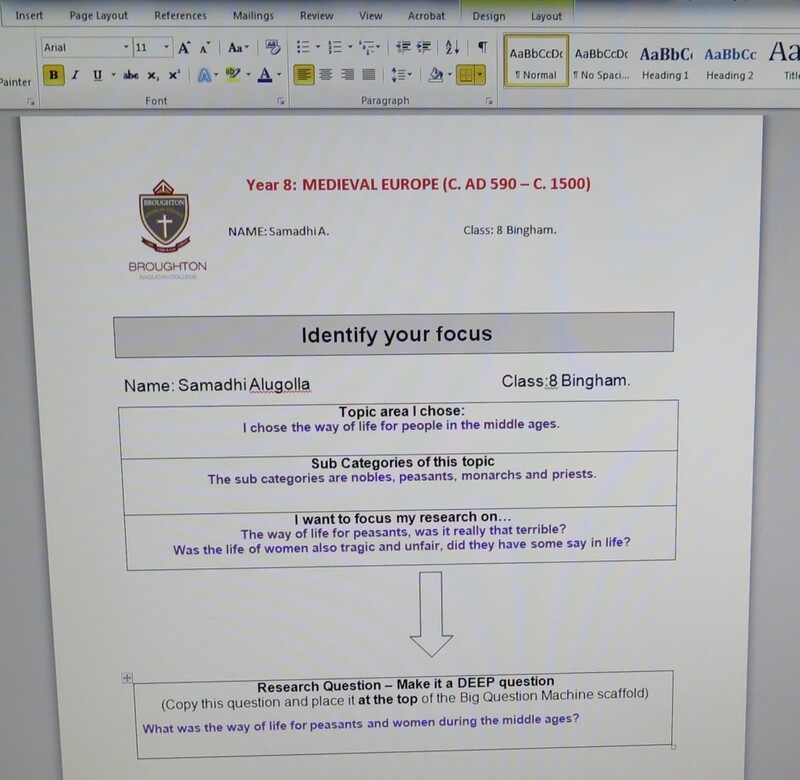 By the time students have read, watched videos and taken notes within their topic area for a number of lessons (actually for three weeks of lessons of Immerse and then Explore) they really know the aspect of a specific area that fascinates them. 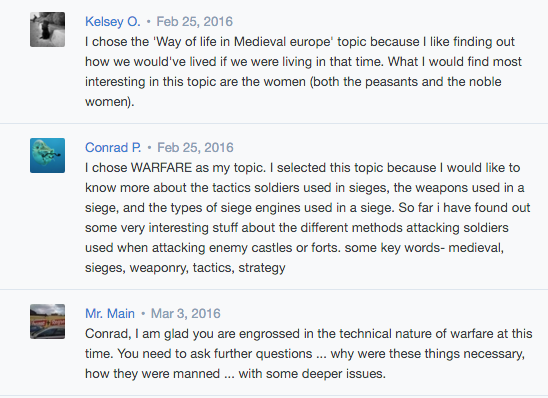 Some have also discussed their topic interests in their Edmodo group. They are sometimes totally overwhelmed by where they want to go with all of this information. This aspect of ‘being overwhelmed’ is familiar to most people working through a sizeable task and the students like to know that we are aware of how they feel. This is when they should complete the second survey for data collection. A time of reflection with their peers and in particular with students who are working in a similar topic area helps them to feel supported and directs them. Actually in this group of students, although some admit to feeling this way, most seem to have found direction ‘calmly’ and this may be that they have been through this whole process only four months ago at the end of last year when they studied Ancient China so thought through issues as they read and knew what to expect. Now is the time to gather a team of teachers to assist! At Broughton we have quite a number of teachers experienced in using Guided Inquiry and some are willing to assist in the couple of lessons where extra help is needed. We always ‘book’ our special needs teachers to assist the students they know will need help and Chris Main (Head of Humanities) comes to the other classes (besides his own) when the timetable allows. 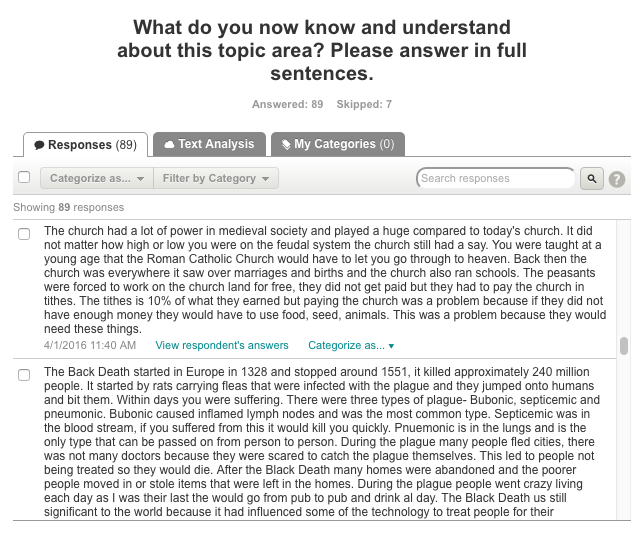 The student’s specific area of interest can now be quite narrow but after considering how this fits within the whole topic area, it is possible to create a question that is rich and deep. 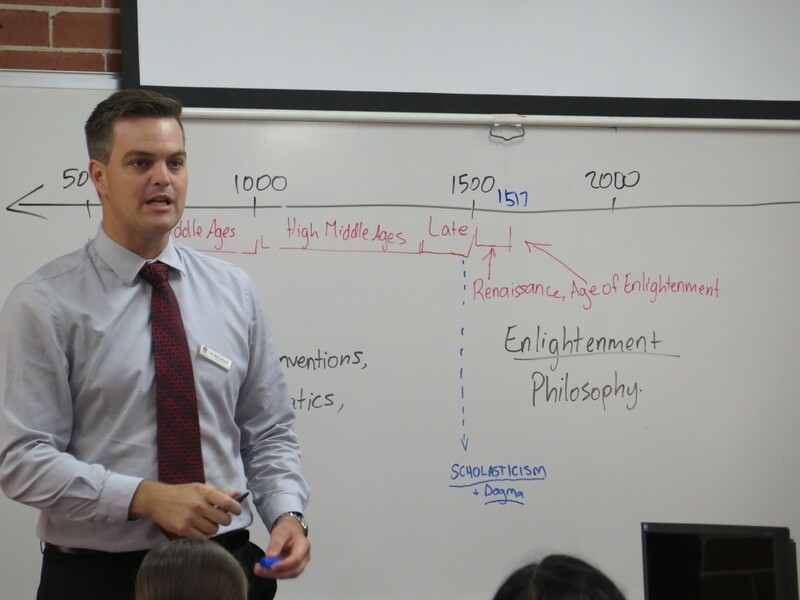 After many years of teaching experience, Chris Main, embraces Inquiry Learning and Guided Inquiry in particular and says that a good teacher has always used elements of this. 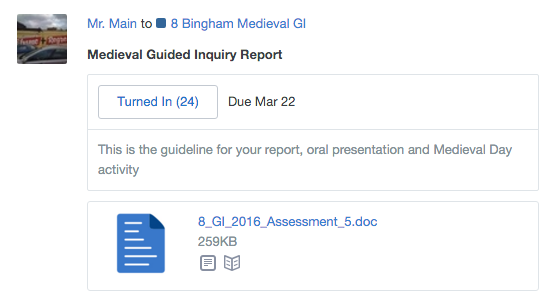 Except for teaching a few aspects of information literacy, I rarely have to do anything in his classroom except to assist students to focus and find what they need in the way of resources. I took a video of Chris introducing the two scaffolds that make up the support method we use to introduce students to writing their inquiry question. I then linked this video via an Edmodo post to the other three Year 8 classes so they could have the benefit of his instruction. Students can now revise this aspect if they need to. It is interesting how well many of the students grasp the idea of writing a deep question and how they work through the table to do this. 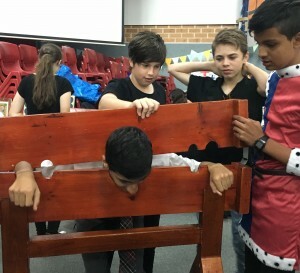 Of course some of these students are working on their third or even fourth Guided Inquiry experience if they have been at this school since Primary school. Because the students in this instance are working in an Edmodo group, the teacher is able to give support throughout whenever they make a comment and also to give feedback on all their scaffolds as they are ‘marked’. 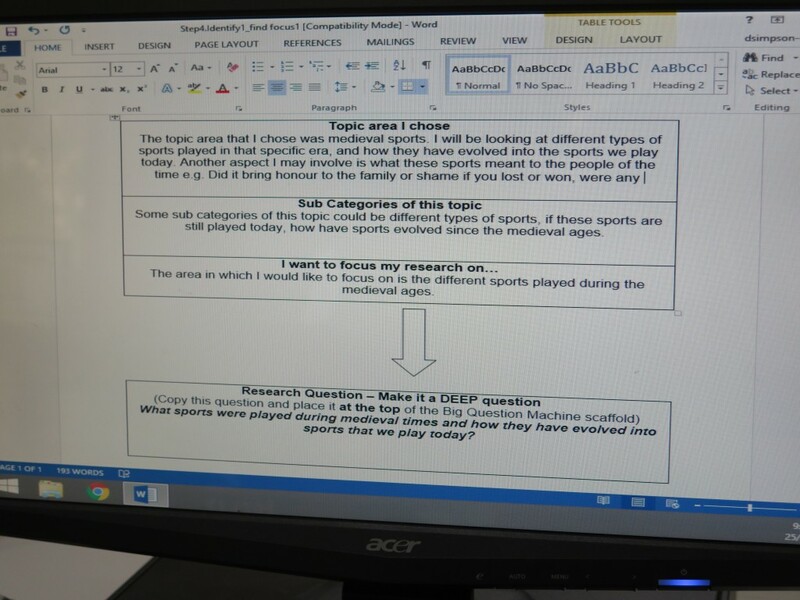 Once a research question has been checked for depth, students are issued the ‘Create’ task which in this case is to write a two to three-page report that answers their question and then they begin ‘Step 5. Gather’. At the end of each lesson Chris Main usually has a short, interesting activity or ‘story’. One day he had prepared a five minute introduction to Chaucer – introducing the writing of Medieval times. Again this video was shared with the other three classes via their Edmodo group. 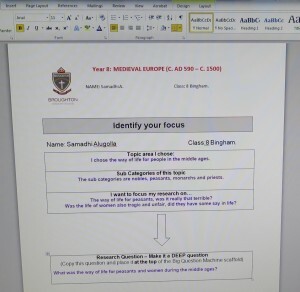 My teaching plan for this week: Many students are still identifying their focus and research question but others are beginning the next step so instruction on that will be given. 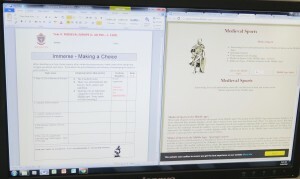 Students will be reminded of planning techniques for writing a report. This helps students in many subject areas when an essay is required. 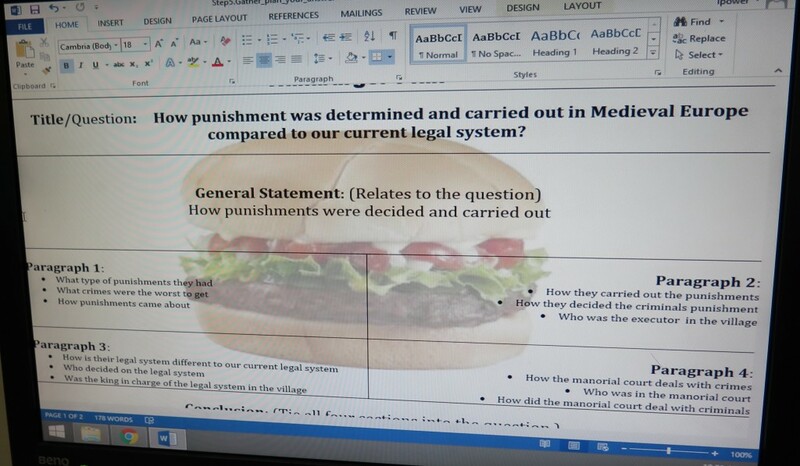 These same students all “endured” my lesson on “ The Hamburger” report in November last year so I won’t go into all the ‘relish and fried onion layer’ details when I tell the ‘story’ this year! The planning scaffold is available to them and they should know exactly what to do this year! From now on the teachers’ (Class and TL) task will probably be a matter of observing and assisting with skills of referencing and finding pertinent material to back up ideas. Hello this is Alinda Sheerman – Lee Fitzgerald’s co-conspirator! I am the only Teacher Librarian and Head of Information Services at Broughton Anglican College (Pre-K to Year 12 with 1000 students.) 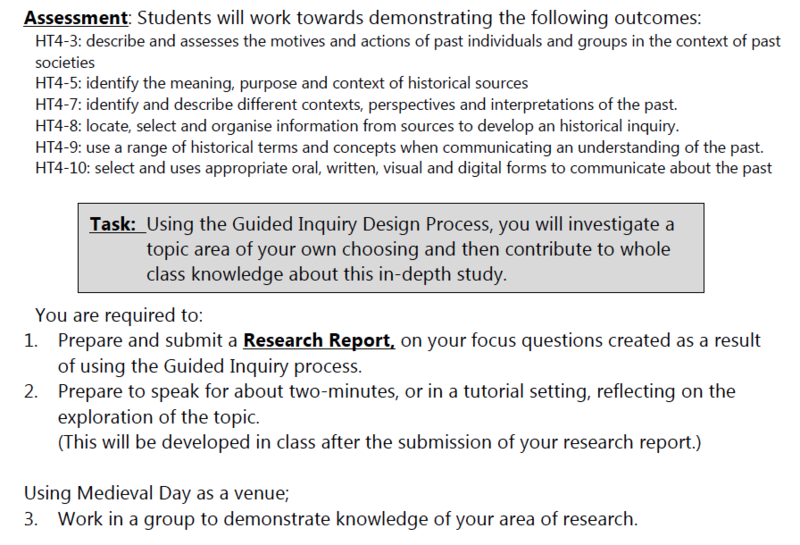 I have worked at Broughton for twelve years and have been collaboratively planning and teaching since 2008 when I began to promote Guided Inquiry as the research pedagogy for our school with the headmaster’s blessing. I took part in Action Research in 2007 to investigate Guided Inquiry as a pedagogy and the results were shared with the staff. This was the same AIS Action Research grant that Lee and other NSW Teacher Librarians took up, and we collaborated as a group on a wiki to share our experiences and results – with Dr Ross Todd as our mentor! Since then I have supported teachers through Guided Inquiry units of work every year with increasing interest from teachers in our Primary section. Some teachers need little assistance now and even support their ‘Grade Buddies’. Every year I find new teachers asking for assistance and they usually go on to repeat the experience. Nevertheless, my life is a bit crazy most of the time! 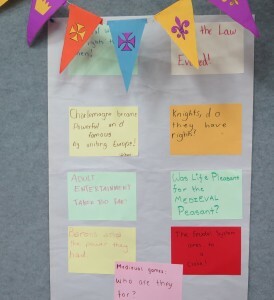 Lee and I thought it would be a good idea to have some TLs actually blog their way through a few Australian Curriculum Guided Inquiry experiences. 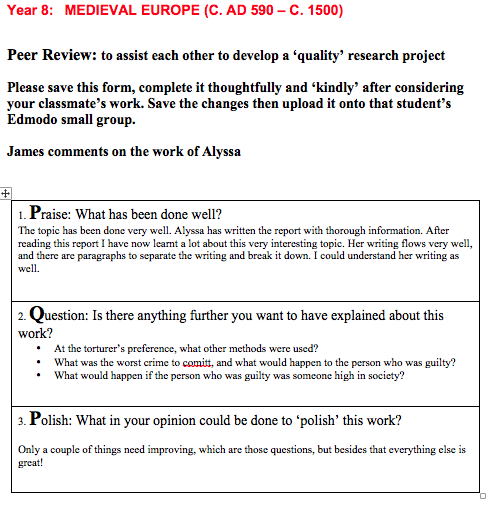 I will take the first turn as we are part way through our Year 8 Medieval Europe unit of work. This is our third week and the four classes are at the Immerse stage with some students extending into Explore. 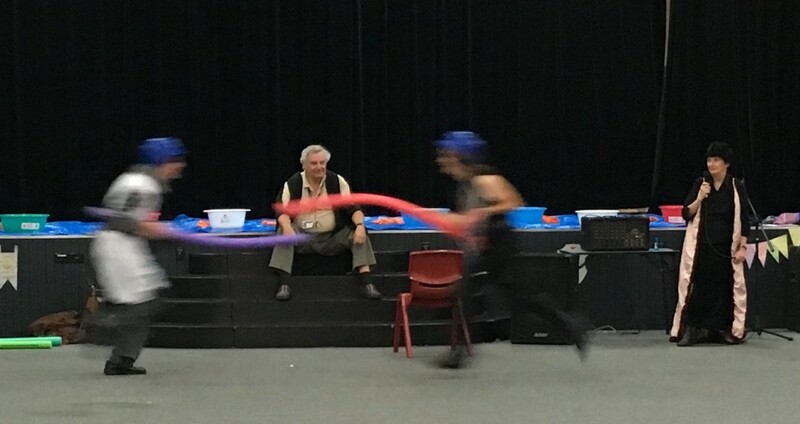 Of course we have had the usual interruptions such as a swimming carnival but the unit of work is still on schedule. Students were given a letter informing parents of the work we were undertaking to obtain permission to share student work samples, images and video so that I can blog online about this unit of work. These have been collected from four classes – a ‘lolly bribe’ to the first class with all handed in worked well! 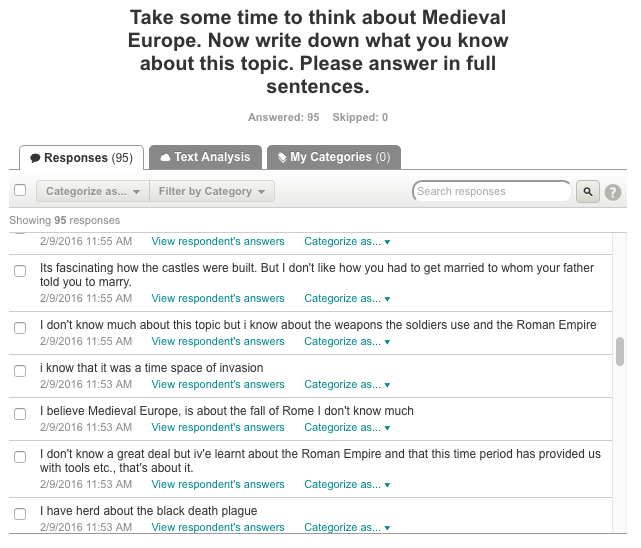 Before learning anything about Medieval Europe, I sent the students a survey link through each class Edmodo group. This survey was to collect data for action research into this unit. We taught the same unit last year using GI and have changed a few things after last year’s survey results so this is now the second spiral of action research. Another survey will be given at the beginning of ‘Identify’ and then a final for ‘Evaluate’. This survey included questions from the ‘SLIM toolkit’. During the first week (Open Stage) we watched two ClickView videos to set the scene. 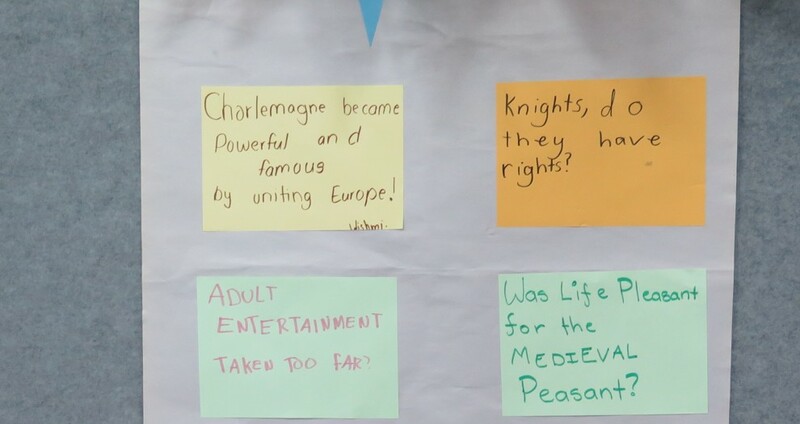 The first was a general overview of the historical period and showed the influence of the Crusades in bringing change to feudal life. The second movie was a close up encounter with life in a small village with a focus on daily life, food, farm life etc. After seeing these movies with all four classes I now feel very knowledgeable indeed! 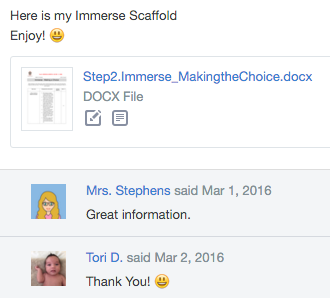 Students downloaded the scaffolds from an Edmodo group folder so they were saved offline and organised in their files. ‘Step 2. Immerse Scaffold’ – Used for searching broadly and at shallow depth for information on the five areas of study set down by the curriculum. Information literacy began with the first lesson as students were reminded about where and how to search for quick authoritative information from books in the library, physical encyclopedias, online encyclopedias, History Reference Centre subscription, LinksPlus for websites etc. Dot points only were given at this stage as students sifted and selected what interested them in order to make a selection of topic area to study in depth. The choice of topic area being made, we then asked them to form circles and defend their choice and speak about where they want to take their topic area in terms of its impact on local life and how aspects changed over Medieval times. 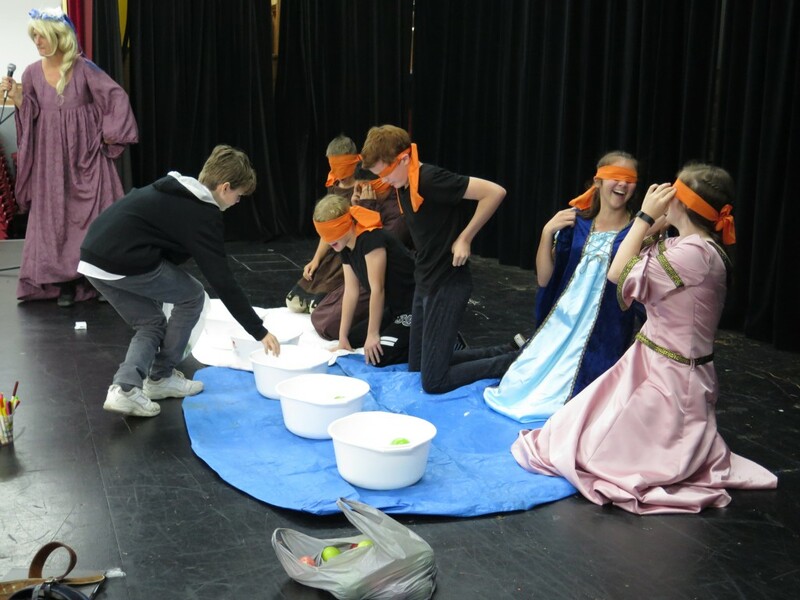 The students really enjoyed this activity. Students also wrote a reflection in a shared Edmodo folder. By the end of week 3 a number of students in each class were beginning the Explore stage. From now on students will be working on different scaffolds so it is important that the whole class has instruction on specific Information literacy skills at point of need. I usually structure this at the beginning of lessons before students begin personal research. The ‘Step 3. Explore’ Scaffold begins with asking students to create a mind map – what do you know and what do you want to find out? 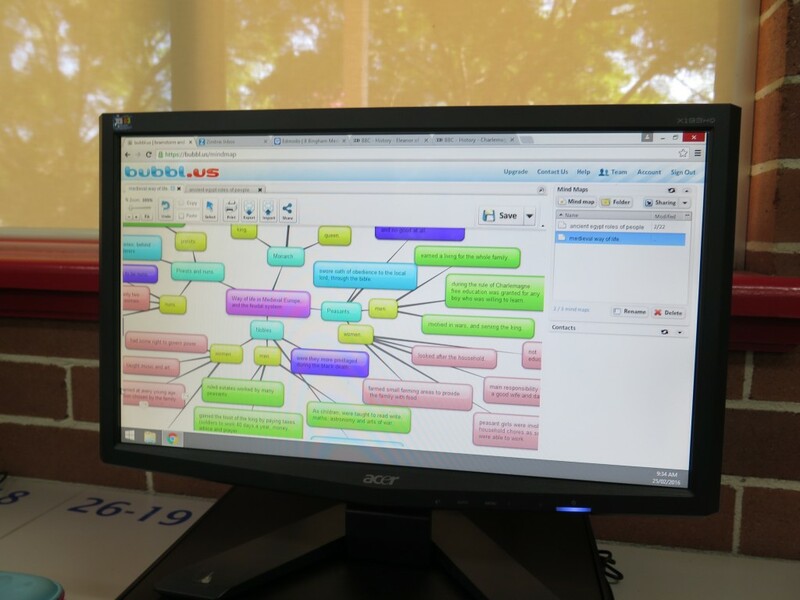 We use ‘bubbl.us’ and instruct students on the purpose of visually mapping out where they are going with their topic areas. The third depth bubble should be contributing questions about their selected aspect of the topic area. 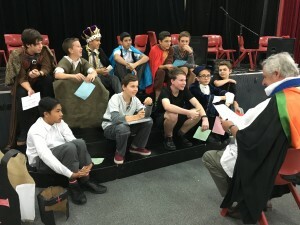 At the start of this stage I conducted a lesson and activity on note-taking skills and referencing – as many of the notes made on this scaffold can be reused later in the Gather and Create Stages. Practice on making a Bibliography entry using an online generator was made for a site they had found on their topic. So far… everyone is on task, apparently really enjoying themselves because they are very focused and ‘buzzing’ when we have ‘share’ time. Coming up soon… The BIG DIP (between Explore and Identify) and how to organise students out of it! 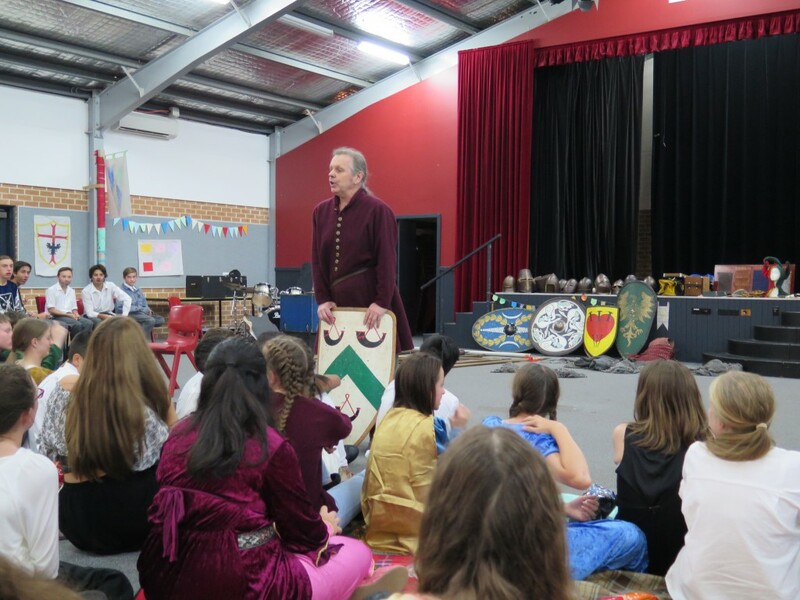 It has been a busy year and I am sure a lot has been happening with with Guided Inquiry in many schools across Australia… but it is quiet on here! Do any of you have more AC programmes to share for others to use or modify for their needs? Please let us know and we can upload them. The purpose of this post is to let you know it is now my turn to blog on Leslie Maniotes’ 52 Weeks of Guided Inquiry blog. Make sure you have read Lee’s posts back in February. My first post is an introduction and a few links to units that are mentioned. I will be blogging during this week about a Year 5 unit on Global Organisations that the teacher and I worked on two years ago but I have never documented. It was my best teaching experience ever! Thoughtfully interpreting information over times leads to deep learning. These concepts are elaborated to define, in a condensed way, the information literacy skills needed to locate, evaluate and use information, to present a comprehensive view of the skills required at each stage of a GI. Its significance lies in its simple iteration of GI skills (very useful in explaining GI to novice teachers), and in the fact that it can be used by planning teams in primary and secondary schools to create a scope and sequence plan for the gradual implementation of GI across the school. Challenges to GI include the difficulties of collaboration between TLs and teachers who are struggling with a content-heavy curriculum, and the impossibility of covering the whole school population with GIs – after all, there’s only so much one or two TLs can do – which means that coverage of GI skills are piecemeal. This simple but condensed information literacy curriculum can form the basis of a whole school approach to GI implementation in the creation of a scope and sequence using the concepts and elaborations in the information literacy curriculum, thus allowing ownership to extend to all teachers in the school. Cheers, and have a great winter break!